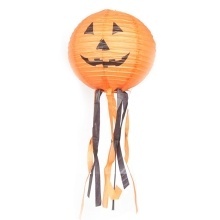 This pumpkin paper lantern is light weight and portable to carry, easy to install, and do not dangerous for children to use, it will be great decoration for holiday and party. Top hook design for both handheld and hang. Made of PVC+ paper material, environmentally friendly and practical. The printing is clear, the cutting is round, the shape is lifelike. Do not dangerous for children to use, it will be great decoration for holiday and party.